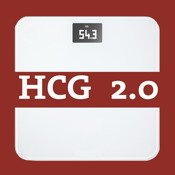 The official app of HCG 2.0 – A Smarter HCG Diet. Medicine is called a practice for a reason. As new technology and research becomes available, treatment protocols evolve. Shouldn't the HCG diet be the same. HCG 2.0 uses advanced research into low-carb, ketosis dieting; caloric ratios and basic food chemistry to create a smarter and more sustainable HCG protocol for the average working adult. Lose 20-30 pounds in just 30 to 40 days.